Shockingly, I bought my’oop about two years ago and, after a couple of attempts that were none too shabby (though I say so myself; wink) I tucked it away safely out of sight. Why? Because I lost my fitness mindset. The trick is to buy a professional hoop. They’re not pricey and are larger and heavier than the typical hoop you’d tend to choose. It’s hard to keep the hoop going if it’s smaller and lighter. Ideally, you want a hoop that – if standing on the ground – approximately reaches your belly button. Mine’s a little shorter than that and works great. I’m just sharing what I’ve heard is ideal. I think so long as you’re in that ball park, you’ll find your hoop will be easy to use. This is almost identical to my hoop. A good weight and diameter for hoopin’ your way to success! 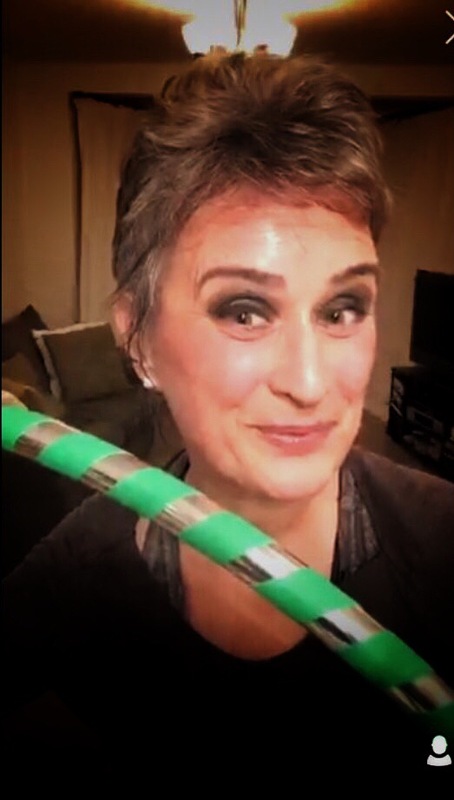 I started hooping six years ago with the larger heavier hoops. I make my own. Great exercise. Great to hear Trudy! What type of hoops do you make? I’ve heard of people making padded ones, to protect hip bones. Also smaller hoops, for arm exercises!